Nothing on here beer-wise of note on my unplanned visit today - the clement weather and the pub's sunny aspect were what drew me in when roaming around looking for some sun-trap at which to enjoy lunch (other than the ever-reliable Dog & Bull which I did earlier in the week - got to respect variety if poss). 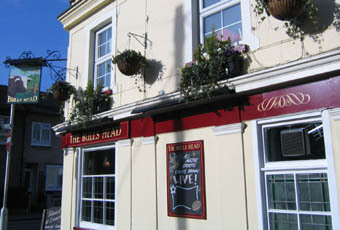 Saying that, the landlord was an affable cove, the place was seemingly in good decorative nick, and moreover the single cask ale - Young's Bitter - was kept just as capably as at the Dog, and sold at a similar price to boot. My basic but tasty toastie went down well for a couple of quid, and all in all it was a pleasant little lunchtime in the backstreets of Banghole, as I believe the area was once known. Cheaper than the Standard, and the seating is not under a flyover. Bonus. A few weeks ago the Bull's Head had a small beer festival, they had a couple of ales from Fyne Brewery,the Jarl was outstanding, the second and third pint were equally good and I believe the beers were £3.00. A nice quiet pub with decent locals.8/10. The perspex bike shed makes me laugh,i don't know why, something to do with school perhaps. Had a beer in this place yesterday. They had Courage Best and Doom Bar on both in good condition. if you are a Whisky drinker this is the place to go, I counted at least six malts above the bar. Oooh ! That rapier wit strikes again i'm cut to the quick , It must be the sheer erudition of your replies. Zzzzzzzzzzzzzzzzzzzzzz. That coming from Head Crapper,bet there`s nothing left after you`ve finished, your so full of it.